IN an impassioned plea to the Transnet National Ports Authority (TNPA), Nelson Mandela Bay mayor Danny Jordaan yesterday called for the long-mooted waterfront at the Port Elizabeth Harbour to be made a national priority. Jordaan was speaking at the official launch of a package of developments collectively valued at about R700-million at the Port of Ngqura. The event was attended by government officials, business leaders and TNPA chief executive Richard Vallihu, among others. It was aimed at outlining the latest developments at the port, its capabilities and functions within the framework of all Transnet port operations and at providing guests with a short tour of some of the facilities. While acknowledging the TNPA’s significant achievements and role in both the national and local economy, Jordaan was forthright in his appeal to the parastatal to remove the fuel tank farm and manganese operations at the Port Elizabeth Harbour. The relocation of the two operations to the Port of Ngqura – which has been beset by years of delays – is key to the establishment of a waterfront development in the Port Elizabeth Harbour and is viewed as critical to the growth of both the Bay economy and its tourism sector. Jordaan pointed out that the ports in Richards Bay and Saldanha Bay had received far greater monetary investment and urged the TNPA to do more here. “The 1820 Settlers were here way before any of the other ports were established, yet Port Elizabeth and East London have the smallest ports,” Jordaan said. “People have been waiting 200 years for Port Elizabeth’s ports to be developed significantly . . . We really need the waterfront development. “We have had lots of international interest in the development of the waterfront. “When are we going to see it happen? “The Port Elizabeth Harbour is going to serve as an automotive hub, but we cannot rely on automotive alone. “A waterfront is going to bring jobs, investment and opportunities. “Please make the removal of the tanks and the ore operation a national priority. “We first heard 2011, 2012, then 2015 and now 2021. We don’t accept 2021 . . .
“We are telling you straight, we don’t accept that date. 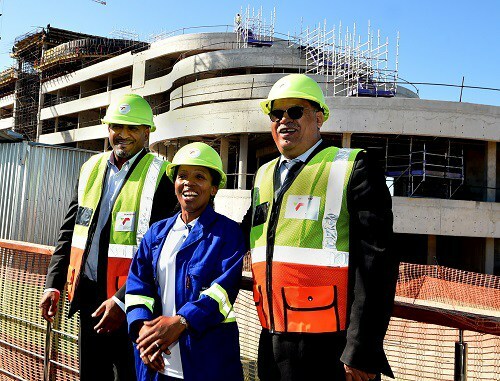 The new developments highlighted at the event included the construction of a R260-million administration building for Transnet, which is aiming for a 4-Star Green Star SA rating. The rating would make the building one of only two in Nelson Mandela Bay to meet the environmental standard. Construction of the eyecatching, energy-efficient building is 50% complete. Of particular interest to guests was the port’s new R130-million vacuum-based automated mooring system installed by international company Cavotec. The system counters the movement of vessels so that cargo can be loaded and off-loaded safely and efficiently . Other developments included the establishment of an administrative craft basin – for vessels like tug boats – and an accompanying administration building. These two projects are collectively valued at R320-million.